The Winter of Our Discontent protests against the War in Iraq, in front of the White House, led to seven protestors getting arrested. As one of the arrested peace activists observed: "They say if you see something that ain't right, fix it. I see half the world starving without a crust of bread while our resources are going to wars in Afghanistan and Iraq." Mike Ferner reports. Washington - February 28, 2006. 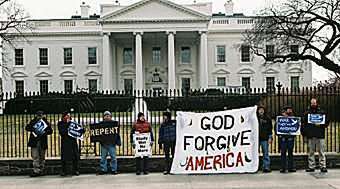 Holding a banner that read, "GOD FORGIVE AMERICA" seven peace activists were arrested yesterday in front of the White House, in a civil disobedience protest against the war in Iraq. Arrested by U.S. Park Police were Brian Terrell, Ed Bloomer, and Elton Davis, all from Catholic Worker communities in the Des Moines, Iowa area; David Goodner, University of Iowa student; Eileen Hansen, a Catholic Worker from the Winona, Minnesota; Jeff Leys, co-coordinator of Voices for Creative Nonviolence (VCNV); and Bernie Meyer, a retired social services worker from Olympia, Washington. The seven were charged with the federal misdemeanor of demonstrating without a permit, fined seventy-five dollars, and released yesterday evening. The action was part of VCNV's "Winter of our Discontent" demonstratons in the month leading up to the third anniversary of the U.S. invasion of Iraq on March 20. "Winter of Our Discontent" protesters that were arrested in civil disobedience action at the White House 2/27/06. From left: Elton Davis, Bernie Meyer, Ed Bloomer, Eileen Hansen, a supporter who did not get arrested (holding banner on left), David Goodner, Brian Terrell and Jeff Leys. Terrell organized the group of 15 from Iowa that included students from Loras College, a hospital worker, and a farmer from Missouri who drove 140 miles to Des Moines to join them. "If not now, when?" Terrell replied when asked why they drove 20 hours overnight to get arrested in the nation's capital. "Some people consider civil disobedience an extreme measure for extreme times. If these aren't extreme times I don't know what are." The Maloy, Iowa farmer and Catholic Worker added, "We came here to use two complementary methods to protest this war. Some of our group are visiting members of Congress, and some are putting our bodies on the line." Goodner, the 25-year-old Iowa Hawkeye, said his reason was "a deep concern for the plight of the world. I worry where the world is heading when I think of global warming and war. I believe the capitalist model of globalization is the root cause of the institutional problems facing us, and governments aren't going to solve those problems, individuals are." Bloomer, 58, an Army draftee who served from 1966-68, is also a member of Veterans For Peace. He said he became a Catholic Worker in 1983 when he was active in the Nuclear Freeze movement to stop the spread of atomic weapons, because he agreed with the Worker's approach. "They say if you see something that ain't right, fix it. I see half the world starving without a crust of bread while are resources are going to wars in Afghanistan and Iraq. This is the right thing to do and it's good to show your colors." The entire group demonstrated on the sidewalk in front of the White House fence, walking slowly with placards and banners for about 30 minutes. The seven who were arrested took their signs to the portion of the fence ruled off-limits to protests where they stood, attracting the attention of Park Police who warned them they risked arrest. When they refused to move, police called in a large team to make the arrests which included six officers on motorcycles, one on horseback, and over a dozen in patrol cars and unmarked vehicles including several command officers, with four Secret Service officers observing. After police roped off a large, square area in front of the protesters, a lieutenant, speaking through a patrol car loudspeaker, warned the seven that "You must leave the enclosed portion of the White House sidewalk. All those not leaving will be arrested." Three warnings later, officers approached the activists and began handcuffing and searching them one at a time. To cheers from supporters and under the eye of dozens of tourists, the arrestees were lead into a large police wagon and taken away. The whole operation took about 90 minutes. Last night, Leys said they had been processed, fined, and released later in the day around 5:00 pm. The former union representative from Milwaukee and three others are participating in a 34-day, liquids-only fast and vigil at the Capitol as part of the Winter of Our Discontent. He noted the fasters are observing the period between February 15, 2003, when millions of people around the world protested the likely U.S. invasion of Iraq, and the date of the invasion, March 20. He added that VCNV plans additional protests in Washington and elsewhere in the country before March 20.